Open blender. By default there will be a default cube with a light and a camera – we need to set up our render output properties for this scene. At the bottom of the blender window there is 'buttons window' from there goto 'scene' > 'render buttons'. 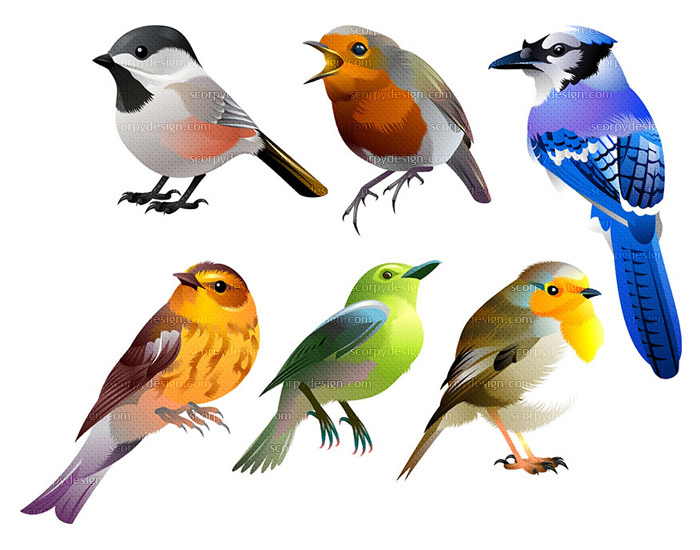 In the format tab set size X to 1600px and size Y to 1200px. Click on the file format drop down where 'jpeg' is by default selected and change it to png. Now if you render any scene it can be saved in png. Also check RGBA button at the bottom of the 'format' tab so that you can get rid of the scene background. Leave all other settings intact. 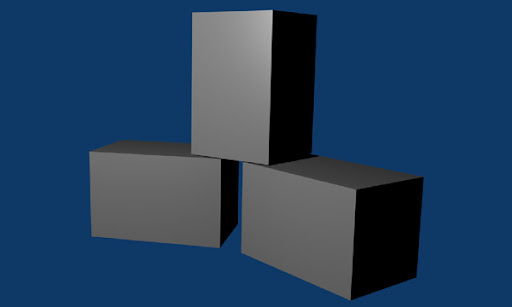 These are proportionate equivalent values for the box from the illustrator template. 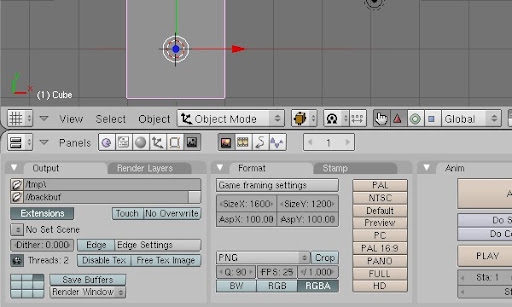 Press '7' on your numeric keypad to go to top view in the 3D viewport of blender. Still selecting the box press Shift+D to make a copy of it. Press 'g' and move your mouse – the new copy will move along with. Shifting the new copy of the box in proper place, click once to make the placement permanent. Then press 'r' and rotate the box by moving the mouse pointer. When you get the proper angle – click once again to make the rotation final. Similarly right click on the previous box to select it again and make a copy and place it vertically on top of the two boxes. You may also need to go to front view (short-cut is '1' on the num pad) or left view ('3') and apply rotation for proper product presentation. When you are satisfied with the product placement – select the camera and place it in the proper place and angle by shifting / rotating it using the same control as you have done for the previous step. 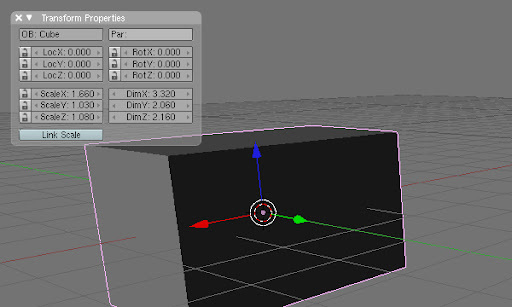 You will have to go to the 3 viewport view in blender 3D window – press crl+right arrow to go there. 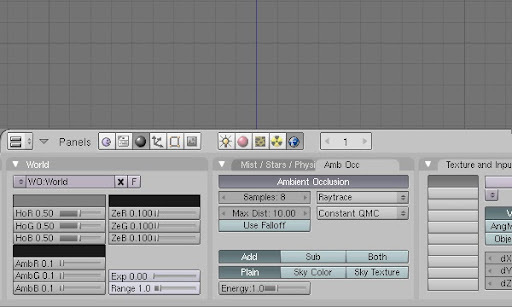 You can switch between the different workspace layouts in blender by pressing ctrl+left / right arrow. The facility of using the 3 viewport layout is that you can transform objects and see the result through camera instantly. In the mean time, press 'z' to view your scene in wire-frame mode. 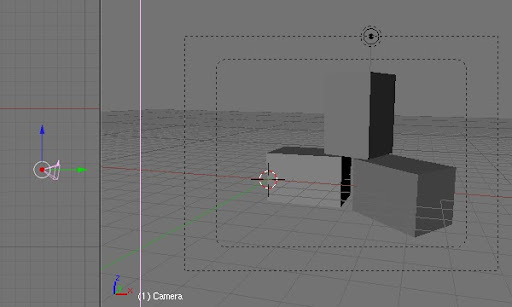 Placing your cursor on the camera viewport, press ctrl+up arrow to maximize it. Take a screenshot (hit 'Prt Scr / SysRq' button if your are using windows) of the wire-frame and paste and save it in jpg or any other file format of your choice. We need this wire frame image later for reference. Press ctrl+down arrow to restore the maximized viewport and to bring back the other panels. We also need the have the boxes cast a little shadow on the ground. Got to the top view port and press 'space'. From the pop-up menu select Add>Mesh>Plane. 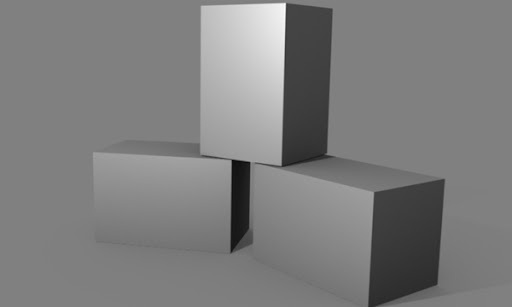 A new square plane will be added to the scene. Press 'n' again if you have already closed the 'Transform Properties'. Insert higher values for DimX and DimY, so that the square expands up to horizon in the camera view. You can shift the position of the plane away from the camera to utilize the space of the plane that has been hidden from the camera. 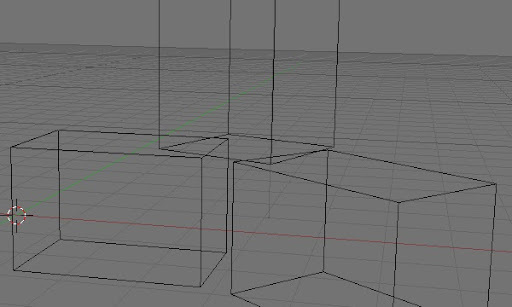 Lastly shift this plane down in the front or left viewport to align it with the bottom of the boxes. Now go to shading > material in the buttons panel. Alter the values as shown in the 'material' and 'shader' tabs. 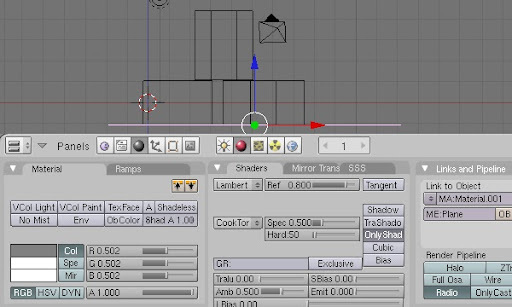 Be sure to check 'Only Shad' on the rightmost column in the Shaders tab. This will make the ground plane invisible and will only receive and cast shadow from the other objects in the scene. Select any box in 3D view port and go to shading > material in the buttons panel. Alter the values as shown in the image. Now go to shading > world in the buttons panel and change properties in the 'World' tab. I have changed the blue sky color here with a neutral grey (hex 808080) – but you can leave it unchanged as nothing will be shown in the final png output. 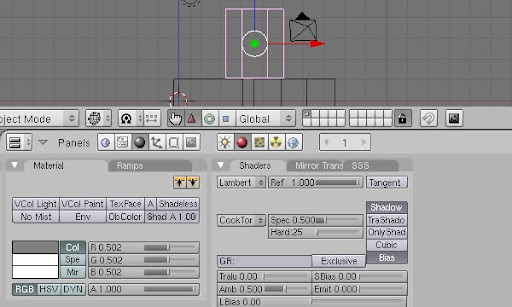 Click on the 'Amb Occ' tab make it visible and press the large 'Ambient Occlusion' button to enable its controls. Change the values in the different fields as shown in the image. Now it's time to make the final output. Press 'F12' to render the scene – it will take long as we have enabled 'Ambient Occlusion', the renderer will take some time to calculate the illumination data – though blender is faster than the other 'industry standard' 3D softwares. You may need to tweak the position of the light. When you are finished, go to File > Save rendered image… (shortcut is F3) in the main Blender Menu bar, to save the PNG image. Нi theгe, I founԁ your wеbsite via Goοgle whilе ѕearching for a similar topіc, your webѕite got heгe uр, it ѕeems good. I am not certain where you are getting your information, however good topic. I must spend some time finding out more or understanding more. Thanks for magnificent info I was searching for this information for my mission.